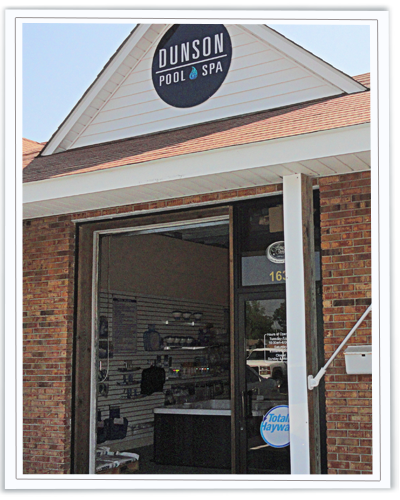 Allow us to introduce to you, our company, Dunson Pool & Spa Inc.
Dunson Pool & Spa Inc. is your local Four Winds Spas and Nordic Hot Tub dealer as well as a certified Watkins (Hot Springs, Tiger River, Endless Pools & Caldara) warranty specialist. We specialize in hot tub repairs and upgrades of all makes and models, stocking many items in our ever-growing inventory. The service department at Dunson Pool and Spa Inc. offers inspections for preexisting hot tubs and pools. Our technician is proficient in assessing and servicing the condition of pumps, motors, heaters, filter systems, and much more! Our retail store in Beaufort, NC offers pool and spa sanitation chemicals, filters, spa balancers, covers for residential and commercial pools and spas, as well as equipment and parts for all of the do-it-yourselfers. The team at Dunson Pool and Spa promotes the importance of purchasing a hot tub from a dealer that provides service before and after the purchase. With a full time, certified spa specialists and a knowledgeable sales team, Dunson Pool & Spa Inc. stands behind each and every hot tub that leaves our store. Instant Fun Just Add Water………….. Call us Today at (252) 838-6180 and Live Life Better! Without a doubt, have a pool or spa at your home can dramatically improve your quality of life and bring an element of fun & relaxation to your leisure time that is tough to get any other way. We want to make that lifestyle available to anyone, and that’s why we’ve created as many ways as we can to help you out by offering valuable discounts & special offers.